The British Film Institute shows that black actors played only 218 lead roles out of 1,172 British films released between 2006 and 2016. There were 45,000 roles in total, this means black British actors played 0.5% of them which is around 6 times lower than the black British population. Number’s don’t lie nor do the experiences of black creatives who struggle to get screen airtime or the black viewers who struggle to find representation. Watching the majority black cast of Ryan Coogler‘s Black Panther was great, but rare, here’s what happens if representation continually allowed to be a surprise occurrence. Don’t get be wrong, I enjoyed watching Noel Clarke‘s Kidulthood franchise, especially because it’s attached to the success story of a Black British man, but although ‘urban crime dramas’ are a reality for some Black Brits- there are many more complex and diverse stories that black British people frequently experience. Often when black actors get leading roles they are cast as the drug dealers, the hypersexualised women or the general thug. Research conducted by the BFI shows that compared to historical films, 45% more black people are given named roles in films about crime. Feeding negative stereotypes is just lazy screenwriting and more importantly, can be psychology damaging to black people. Research has shown that being fed stereotypes of limiting characters can lead to black people internalising these stereotypes. It can also lead to white people being expectant of black people to fulfil these stereotypes- for example this can lead to exaggerated views on expectations of black criminality and violence. The mainstream media often overrepresents black male success stories as being sports stars or rappers, not that these people are not successful, but by seeing only a few types of “role models” then the perceived opportunities by young black males seem limited, over saturated and often unrealistic options. Representation and inclusion don’t just benefit one part of society, but in fact all parts. A diverse and representative media landscape will indirectly educate society about some of the issues marganislied communities face. Since education is the mother of empathy, representation will lead to a more tolerant and engaged society. 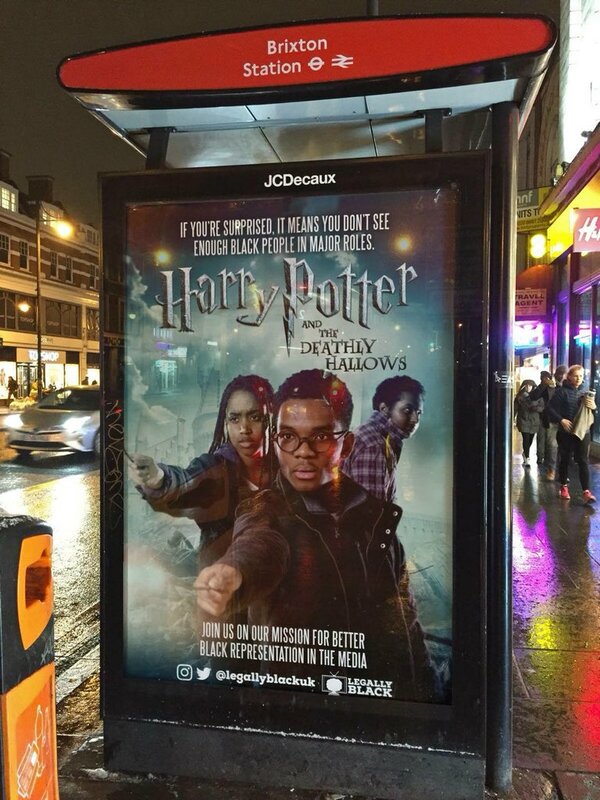 This is why I was so gassed when I saw pictures of these educational yet daringly creative re-creations of famous TV shows and Blockbuster films on bus stops across London. More grease to the elbows of the Advocacy Academy young activists Liv Francis-Cornibert, Kofi Asante, Shiden Tekle and Bel Matos da Costa, all 17, who had enough empathy to educate the public about such an important issue. To follow more of their exploits check them out here. If you’ve read all the above and still don’t see the fuss for better representation, just imagine how you would feel paying to watch TV and barely seeing anything that positively represents you.